If you've ever picked up a well-played Strat from the '60s (or if you're lucky, the '50s) you would probably have noticed that some areas on the edge of the fingerboard have become naturally rounded due to wear from years of playing -- adding to the overall mojo and vibe of the instrument. 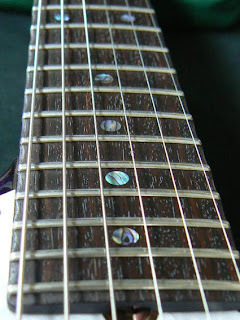 When viewed at a certain angle, the fingerboard edges, meticulously shaped by hand, appear to be almost scalloped, with a slight concave between each fret. What this translates to is a very smooth playing neck, since all sharp angles have been painstakingly sanded out of the equation. Hey, I see you referencing eBay listings. Be sure to join their affiliate/partner program. You can earn some spare change linking to those listings! I know.. Tyler's headstocks are not for everyone. Thanks for the eBay heads up JP! Much appreciated. I agree with you about the resonance -- my Psychedelic Vomit (what a name I know!) sounds like a 335 when played acoustically. And I absolutley love the Tyler headstock!